While exporting to any mobile platform, all your images in your export folder looks like this example c2 logo and it does not matter what size your images are, so your download size is 4 times the size as it should be and your images looking weird. No capx needed for this issue. Open Construct 2 and start a new project. Create a sprite and import a image or just draw a image. Export to any mobile game. Open your export folder and check your image folder and see this result. All images in the right size and looking normal. edit: just tested also export for html game and same result. Closing as no .capx provided (it is mandatory). 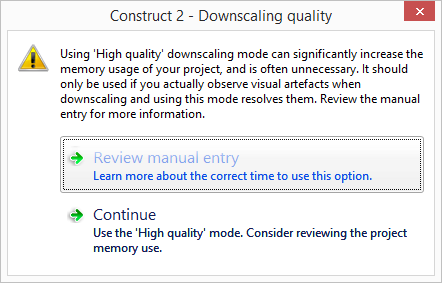 Note that the behavior you describe is by design if you choose "High quality" downscaling mode. If you had provided a .capx, I would have been able to verify that you had chosen this option. This is how "High quality" has to look like? This doesn't make any sense to me, can you please explain. It was exported as high quality Full screen and down scaling. Guess you didn't follow the link. Yes, in order to produce absolutely flawless downscaled images, it is necessary to pad them to a power-of-two size and repeat the last row and column of pixels across the image area so that mipmap generation never exhibits artefacts. However it is rarely necessary and "medium quality" suffices just fine for most games, and doesn't go to that extreme. Construct 2 now prompts when you choose that mode because you aren't the first person to choose the option without being aware of its consequences. Thanks for the reply, but I still don't understand why you need to pad them to a power of 2 to get a better quality. All my images are a power of 2 and the reason I wanted to export to high quality is that I blow up my images in the game to keep the download size small, most of my images are 32x32 and 64x64 or 32x64 etc. and blow them up as 64x64 to 128x128 etc.